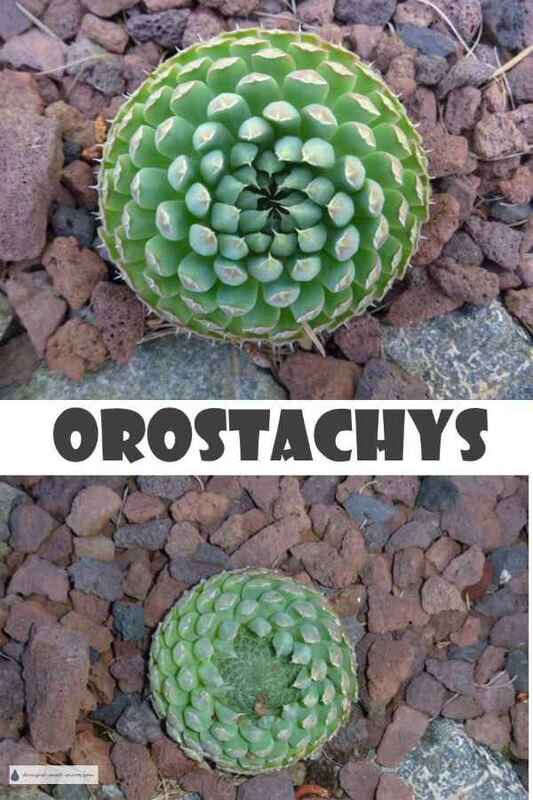 Orostachys are a group of rosette forming plants consisting of thirteen species in the genus. Some species have two types of leaves forming a taller outer ring on each rosette, encircling a short spiraled center. In other types, they resemble an odd looking Sempervivum and you would be excused for not realizing that they're a completely different genus. They are also similar to Sempervivum and Jovibarba in that they are monocarpic; they will form an interesting cone shaped flower stalk which explains the common name of 'dunces cap' after which the main rosette will die, hopefully leaving behind a ring of smaller 'chicks' to take its place. One species, Orostachys spinosa originating in Siberia and Mongolia, is reported to be the most cold tolerant of all plants that have Crassulacean Acid Metabolism systems. They can survive down to -40 degrees Celsius, and can even photosynthesize under snow cover. Height variable to 5cm 3"
They require very good drainage at all times, and prefer to be dry during winter. Avoid getting water on the foliage to prevent rotting. They will perform best in bright sun. 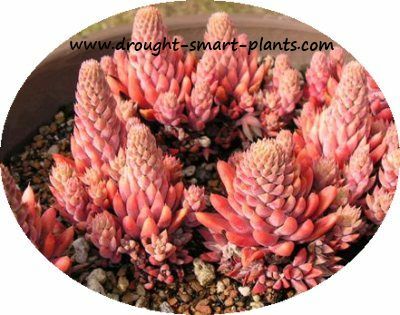 They apparently prefer very shallow soil as well, which works to my advantage when planting in odd and unusual containers for succulents such as hypertufa troughs. I'm always on the look out for more species of this unusual and interesting genus. I don't mind growing them from seed, or welcoming a tiny offset or chick into the collection. Orostachys minuta - a bright green version of Orostachys spinosa, but much smaller. The biggest rosette in this picture is only about 2.5cm (1") across (the size of a quarter). I'm also hoping to get some seed of Orostachys thyrsiflora - the most evil looking of the Orostachys tribe, with long and pointed outer leaves, guarding the inner center, with its spikey foliage. As I find out more about these weird looking and challenging plants, the more I am fascinated by them. I'm looking forward to some success with growing them in my xeric gardens. See this page for more fascinating information about Orostachys pollination. My all time favorite rare hardy succulent, Orostachys spinosa is truly unusual. The color, which reminds me of semi transparent celadon porcelain, is like a glacier. The funny spiky foliage is fascinating, and ever changing over the season.